Many times women after child birth or cesarean section operation have stretched their abdominal muscles and skin to such an extent that from where they can not return to normal. The skin and muscles of tummy become sagging and loose. Ageing or excess weight loss can create the similar situation. Abdominal sculpting refers to changes to improve a woman’s figure in a curvaceous way and add to the length to the torso. The aim of Liposculpture and Abdominoplasty is always to create harmony and add balance to the female form. The overall result is a more contoured and shapely torso. Abdominoplasty, known more commonly as a "tummy tuck," is a major surgical procedure which tightens the abdominal muscles and removes sagging, excess skin and accumulated fatty tissue from the upper, middle and lower abdomen. The procedure can dramatically reduce the appearance of a protruding abdomen and a more defined, flatter, and youthful-looking abdominal region is achieved. As an added benefit of this procedure, the waistline will even become smaller and stretch marks are removed. Most commonly, a long incision is made across the hipbone directly above the pubic area, with a second incision following to free the navel from surrounding tissue. 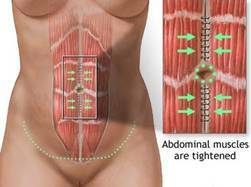 The skin will be separated from the abdominal wall up to the ribs (in mid line only), to reveal the vertical muscles in the abdomen. Then the muscles are tightened by pulling them close together and stitching them into their new position. Skin is re-draped and excess skin is excised. New youthful navel is created. As popularized by Brazilian plastic surgeons, the traditional Abdominoplasty is now combined with Liposculpture in order to recreate more enhanced curves by removing undesired pockets of fat. These troublesome pockets tend to be located in the upper abdomen, side flanks and the so-called love-handles. Combining Liposculpture during the tummy tuck also allows better draping of abdominal skin once the muscle layers have been surgically repaired. The overall result is a more contoured and shapely torso. The alternative tummy tuck technique designed to treat problem areas existing below the belly button is referred to as a "mini tummy tuck." This less invasive form of Abdominoplasty is frequently performed on an outpatient basis and can be carried out under local anesthesia. 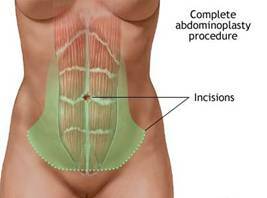 General or regional anesthesia for full Abdominoplasty. Mini tummy tuck can be done under local anesthesia. Two to three days. Mini tummy tuck patient can go home same day. Return to work within two weeks. One can begin light exercise 2-3 months following surgery. There will be a long transverse scar across the lower abdomen. The exact quality of this scar and its width cannot be determined before operation since different individuals scar differently. Swelling and discolouration around the operative area may persist for several weeks. Areas of the abdomen may be numb after operation. Which is often temporary. Muscle soreness immediately after the operation, may last for few days. There may be accumulations of fluid beneath the skin that may require drainage or aspiration, and it may be necessary to repeat this procedure several times. There is a possibility that blood may collect beneath the skin flaps during the postoperative period. If this happens, it may be necessary to open the incision and remove this accumulation of blood.